For someone who had never heard of pickleball, Kyle Yates sure took to the sport quickly. The first time Yates entered a national tournament, he walked out with a gold medal the same day. Just two years later, the 21-year-old Fort Myers native is one of the best pickleball players in the country. At the U.S. Open Pickleball Championships, starting Wednesday at East Naples Community Park, Yates hopes to take home the tournament's top prize and the winner's check. 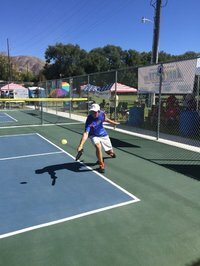 One of the youngest players on the national circuit, he's also hoping to show the local crowd that pickleball isn't just for retirees. "Pickleball gets a bad rap," Yates said. "When I started playing (nationally), I realized it wasn't an old person's game. The guys I play against are in their mid-20s and former college tennis players." Yates has won more than a dozen titles at pickleball tournaments from California to the Midwest to the East Coast, all before he could crack a cold adult beverage to celebrate. Yates turned 21 just last week. For once, Yates won't have to get on a plane or drive overnight to get to a national event. With more than 800 players, the U.S. Open in Naples is the biggest organized pickleball tournament is the sport's history. Yates expects to be on center stage just down the road from his hometown.